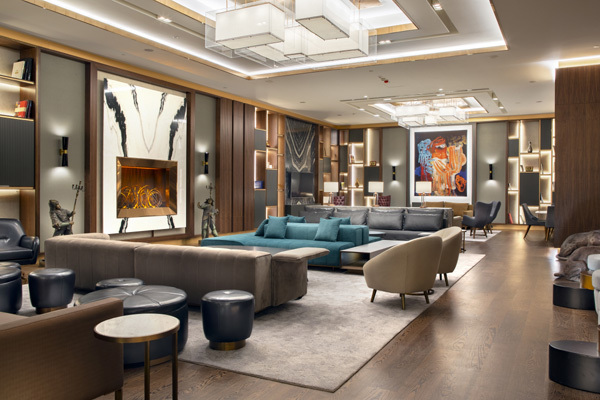 Istanbul’s bustling business district has welcomed a stunning addition to Hilton’s growing portfolio in Turkey – Hilton Istanbul Maslak. Boasting a stylish and chic design, beautiful interiors and unmatched amenities, including a dedicated art gallery, Hilton Istanbul Maslak promises both business and leisure travellers alike an unequivocal first-class hospitality experience. The hotel joins 61 existing Hilton properties in Turkey and is the latest addition to the hospitality leader’s flagship Hilton Hotels & Resorts brand. Conveniently located just a 30-minute drive from Ataturk Airport and a short walk to the subway station, corporate offices, high-end shopping centres, and concert halls, Hilton Istanbul Maslak offers 284 contemporary spacious guestrooms, from Deluxe Rooms to Executive Rooms and Suites – all boasting a functional design and beautiful city views. Guests staying in the hotel’s Executive Rooms also have exclusive access to the Executive Lounge, where they can sit back and relax or make the final touches to a work assignment, all while enjoying a continental breakfast or complimentary refreshments. The perfect address for hosting a business meeting or a memorable occasion or event, Hilton Istanbul Maslak offers more than 6,600-sq-m of event space, including a starlit rooftop venue, a 850-sq-m pillarless ballroom, and 22 meeting rooms spread across three floors and that can accommodate up to 1,200 guests, all equipped with the latest and most sophisticated A/V technology. The property’s unique features also include a dedicated art gallery in the lobby area, which allows guests to catch a glimpse of the universe through a vibrant display of artistic talent from around the globe. Guests can experience the world of art and photography with the hotel’s ever-changing art exhibition and enjoy a few quiet moments in the inviting lounge area. From the moment they walk in, visitors will feel inspired by the creative brilliance on showcase. Home to offices of some of the world’s largest multinational companies, as well as sports arenas, music halls, and designer brands, Maslak offers visitors the perfect combination of business, leisure, and entertainment. The booming Istanbul district is one of the busiest commercial hubs in Turkey, which continues to be a sought-after destination by both holiday-seekers and business travellers because of its immersive culture, beautiful land and seascapes, and role as a global business hub. Hilton’s continuous expansion in Turkey is a reflection of the country’s bolstering tourism sector growth, which in turn has driven the demand for quality accommodation. According to Turkey’s state news agency, Anadolu, the country hosted 32.4 million foreign visitors in 2017, a 28 per cent increase from the previous year, and is expected to see a record high of 40 million tourists in 2018, with its tourism generated income climbing over $30 billion by end of the year. Both the country and the city of Istanbul have been ranked among the world’s top Mice destinations because of their place on the map as a bridge between East and West.